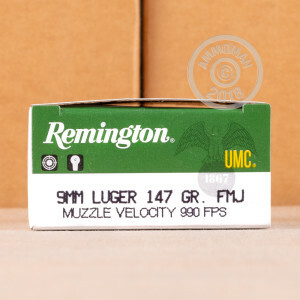 This is Remington's 9mm UMC 147 grain FMJ ammo. These rounds are perfect for the range, training or target practicing which is why many law enforcement agencies across the country use them. 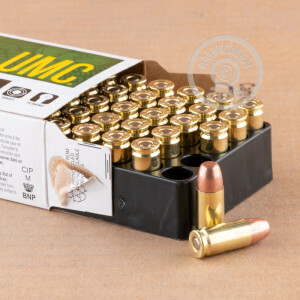 This ammunition is new, non-corrosive, boxer-primed, and feature reloadable brass cases. Remington designates this ammo as "Metal Case", but it's essentially the same as a Full Metal Jacket. 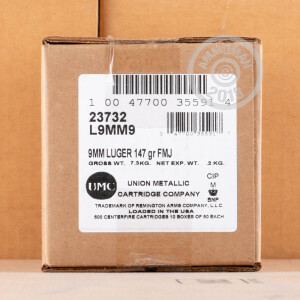 Union Metallic Cartridge Company (UMC) has made some of the best ammunition in the United States for almost 140 years. This Remington division is passionate about innovation in ammo manufacturing, and in fact, was the first company to produce centerfire ammunition. Remington has several plant locations, including New York, Arkansas, Kentucky and Ohio. Grab this case to get free shipping from AmmoMan on your order over $99!